I couldn’t think of a better last day than having it be the last Shop at the Dock. 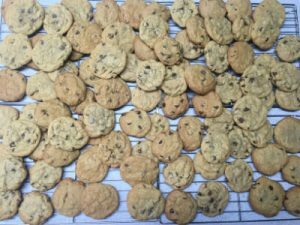 I spent Thursday making some baked goods to thank all of the fishermen who participated in the program (and tolerated our presence on the docks). Through all of the events, the best part was getting to see how grateful participants and fishermen were and I’m lucky to have been a part of it. I am unbelievably proud of this. With the program over, I’ll look forward to spending some time with my family, getting in some traveling, and finding a job. I’ve always been interested in science and education. 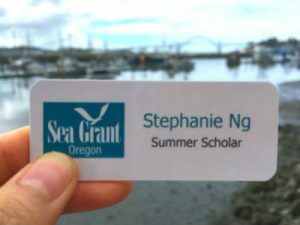 Helping with Shop at the Dock and being a part of Sea Grant has solidified my interest in pursuing both. It was really great seeing what a powerful tool education can be and I’d like to find a career where I can incorporate education and outreach with science. I wanted to finish off by thanking the village of people who worked so hard to make this summer happen. 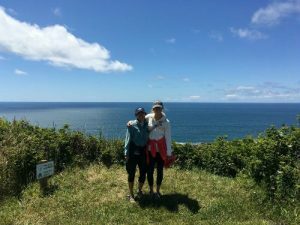 So thanks Haley, Mary, Sarah and every other Sea Grant employee who made the Summer Scholars Program possible. I am eternally grateful to my mentors, Kaety Jacobson and Kelsey Miller, for the wealth of information, the never-ending guidance and support, and for being a constant source of inspiration. Also huge thanks to the rest of the Shop at the Dock crew- Jess Porquez, Amanda Gladics, and Mark Farley- for teaching me about Newport, fisheries, different career paths, and how to be understanding and gracious towards others with conflicting opinions. Thank you to my fellow Summer Scholars, who made this summer unforgettable. I’m so grateful to have been surrounded by such incredible, kind, and caring people and I will miss you all dearly. Cheers to the many outdoor adventures, the endless sass and sarcasm, the great meals and conversations, and everything in between. And finally, thanks very much for reading and (hopefully) listening along with me. I’ll finish this post with my final song of the summer from Edward Sharpe and the Magnetic Zeros called Home. Partly because I’m happy to be headed home for a bit, but mostly because I’m so grateful to have found a little piece of home along the Oregon Coast. Newport, you will be missed. I’ll admit, I’m a pretty nostalgic person. So as we approach the end of this summer, I’m definitely feeling blue about all the lasts that are coming up. This past Friday, we had our last official Sea Grant get-together to present our research. I was really excited to discuss my work and even more excited to see what everyone else did over the summer. As Haley introduced us, she mentioned one of the personal or professional goals we made at the beginning of the summer. While I accomplished my goal of learning how to cook seafood three different ways, I’m still trying to explore new ways every chance I get. In the Shop at the Dock participant surveys, one respondent asked us to provide more recipes. My mentor suggested I email some people from different seafood commissions. I was referred to an amazing resource at www.seafoodoregon.org. 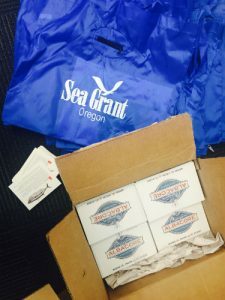 Seafood Oregon does marketing, promotion, and education for four of Oregon’s industry-funded seafood commodity commissions- the Albacore Commission, the Dungeness Crab Commission, the Salmon Commission and the Trawl Commission. The website has great information on all these commissions and about 150 recipes. I’ll be looking at these for inspiration as I finish the last of my tuna and rockfish. This past weekend was also our last official weekend and it was filled with everything wonderful about summer. From volleyball to a bonfire on a luminescent beach to the Great Albacore Tuna BBQ Challenge, it was an idyllic weekend. And while I reflect on some of the last things of the summer, I’ve also been thinking of all the things I tried for the first time. This summer was the first time I studied the environment and sustainability through an economic perspective. It was the first time I went camping in Oregon. It was the first time I bought seafood from the fishermen who caught it. The list could go on and on, and I’m so grateful for this opportunity that allowed me to try so many new things. 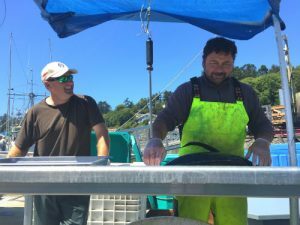 I’ve been writing about buying seafood directly from local fishermen for weeks now. While I’d had fresh and local seafood, I had yet to purchase anything off the docks myself. With the summer almost over, I decided it was time to put my money where my mouth was and seize the oppor-tuna-ty to buy something at Shop at the Dock (writing posts for the Fisheries Extension Facebook page has brought out the best of my fish puns). At the end of Shop at the Dock, I stopped at F/V (fishing vessel) Triggerfish to complete my survey and placed an order for a tuna. Triggerfish is owned by brothers, Ernie and Joe. Like many other boats, they often fish at the beginning of the week and come back Thursday night or Friday morning to sell off the docks over the weekend. Alternatively, there are boats like H/F/V (historic fishing vessel) Chelsea Rose that are essentially floating fish markets. Their seafood comes from other boats they own and other fishermen, so they are able to stay docked everyday. Tunas average 10-20 lbs, but some can get MUCH larger. It is priced per pound for the whole fish and there is an additional fillet charge. I asked for a 14 lb fish, so Ernie weighed several fish until he got one about that size. The recovery rate (the amount of meat recovered after filleting) is roughly 50-60% for tuna, so I was to expect about 7-9 lbs of meat. I already knew that I wanted to split a fish with my mentor, so once I was satisfied with the fish, I asked for it filleted and split in half. It’s regulation that boats sell whole fish to avoid contamination, but most boats are willing to split the fish for you so you can purchase with other people. I made sure to bring a hot-cold bag and cash to pay for the fish (because most don’t take cards). I kept the tuna on ice and when dinner came around I marinated it in brown sugar, soy sauce and garlic. 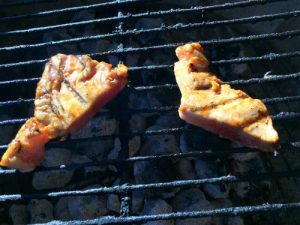 I ended up having it raw, seared and barbecued and it all tasted fantastic. There is something really thrilling about knowing where your food is coming from. I love that I was able to see a whole tuna fresh from the ocean in the morning and eat it for dinner a couple hours later. It was quite the experience and I know I’ll definitely miss Newport’s seafood at the end of this summer. That’s all for now. Thanks as always for reading! At this point, the Shop at the Dock crew (we even have matching jackets) has gotten the routine down pretty well. We set up camp, explain the program to passersby, ogle at the cute dogs on the dock, runs tours, and pack up. Every time, the event passes by more quickly than I expect! This vessel catches hagfish, which is an eel-like fish that produces sticky slime to defend itself from predators. Last week’s wind left many fishermen unable to fish, due to unsafe waters. As a result, fewer vessels were able participate in Shop at the Dock and sell over the weekend. We still had a couple of vessels selling though, but hopefully next week will bring smoother sailing. I went out on one of the tours with my mentor and while I’ve gone with her on several dock walks with her before, I feel like I learn something new every time. 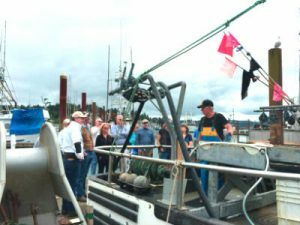 The tours are generally broken up into two distinct parts, beginning with information about commercial fisheries. Often times, tour guides will walk the group to different vessels and explain what it’s rigged to catch. It’s then followed by a section on how to actually purchase the fish- how to look for a vessel that sells off their boat, what questions to ask, what to look for in a good, fresh fish. And if we’re lucky, one of the fishermen will come out and answer questions, which brings out a more personal side of the industry. During this specific tour, I learned that one of the vessels was used to transport criminals to Alcatraz, including Al Capone. Vessels, like Ocean Lady ‘M’, will often post signs or banners to let people know they are selling seafood. The Comment of the Week comes from a survey questions asking if there was anything else participants would hope to learn more about. One respondent answered “fleet perceptions of direction of their industry”. I think this comment was particularly striking to me because it examines the livelihood of the whole industry and touches on a more personal side of the future of fishermen. There seems to be a real interest and concern for the fishermen. In fact, many participants have expressed the desire to know more about the fishermen themselves and the history of their boats, which is really great. There are three Shop at the Dock events left for the summer and I’m excited to see what else lies ahead. Thanks for reading! Another successful week for Shop at the Dock! The day started off with a heavy drizzle and for a bit, we didn’t expect anyone to show up. But the drizzle subsided and we had even more people show up than last week. Getting the surveys filled out has been a bit of a struggle, but we’ve started following up with an email, which has been really helpful. I’m completely floored by the positive feedback we’ve gotten from both surveys and in person. According the the surveys so far, almost 70% of participants bought seafood at Shop at the Dock and nearly 75% of participants spent money on other activities in the area. 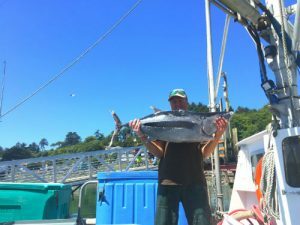 It’s amazing that this one educational program has brought an economic boost to both commercial fisheries and local businesses. Being a part of the Shop at the Dock events (along with the pressing matter of real adulthood) has had me thinking about what I want to do in the future. It’s really great seeing what a powerful tool education can be and I can definitely see myself working at the intersection of science and education. This week, I came across an article about global fish production. According to a 2016 study by the UN Food and Agriculture Organization, global fish production is approaching its sustainable limit. As I mentioned in a previous blog post, sustainability issues can arise due to the lack of transparency in the supply chain and inadequate inspections, which makes efforts to find sustainably caught fish ever more important. 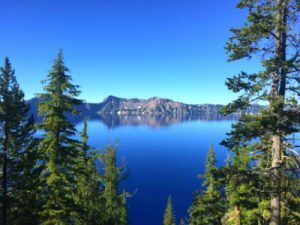 As for non-work related updates, this past weekend, some of the other summer scholars and I went to Crater Lake. The color and clarity of the lake was absolutely stunning and almost unreal. 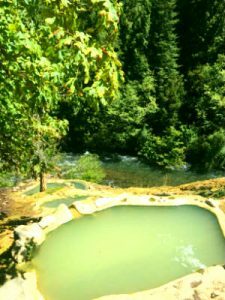 We also visited Toketee Falls and Hot Springs, which were lovely and warm and definitely worth a visit! Thanks as always for keeping up. More updates next week! As we’re already halfway through our 7th week, I’ll finish this post with a song by Flaming Lips- “let them know you realize that life goes fast; it’s hard to make the good things last”. I feel like a broken record, but where did the time go? Already halfway through the summer and it feels like I just moved in last week. Last Friday was the first Shop at the Dock event. While this is the third year of the program, this year was a bit of an experiment in terms of staggering tours, due to the popularity of the program last year. We weren’t sure whether it would draw huge crowds (which makes the tours difficult due to limited space on the dock) or no one (also makes the tours difficult…), but it ended up being nearly perfect groups for each tour. Everyone seemed really excited and happy to learn about buying off the dock and quite a few people left with seafood. 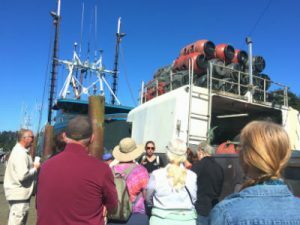 Even more than that, the tours seemed to address one of the key issues: people being intimidated or scared by the process of buying directly from fishermen. One of the survey questions was “What was the most important thing you learned from the Shop at the Dock Program?” and some of my favorite responses were “fisher people are nice” and “non-fisher people are welcome”. I’ll continue surveying both participants in the program as well as the fishermen every week to look for ways we can improve the tours week to week and to assess their economic impacts. 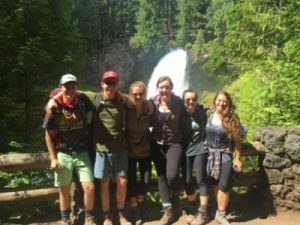 Right after Shop at the Dock, the summer scholars headed to Willamette National Forest for a weekend of camping. It was definitely nice to unplug from technology and moving inland made it feel a bit more like summer. By some miracle, I only left with two mosquito bites (thank you, mosquito gods). The beautiful views in Oregon are endless and I’m so grateful I’ve had the chance to experience them. More updates to come next week! Thank you as always for reading. I’ll finish it off with a song from a local band, Hemlock Lane, (from Eugene, Oregon! ), who captured this weekend pretty perfectly- “in the car, on our way to better places, without a care, we’re halfway there”. In 2012, an ocean conservation group, Oceana, conducted one of the largest seafood fraud investigations in the world to date. They collected over 1,200 samples from 674 retail outlets in 21 states to determine how honestly seafood was labelled. The results were staggering. Of 1,212 seafood samples, DNA testing found 33% were mislabeled, according to U.S. Food and Drug Administration guidelines. Mislabelling can occur in several ways. Wild fish can be swapped for farmed, which can lead to consumers paying almost twice as much. Species can also be swapped. 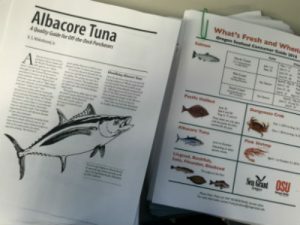 Oceana researchers found that 84% of white tuna sampled was substituted with escolar, a species known as the “Ex-lax fish” because it can be known to cause digestive problems (yikes). And although the U.S. imports up to 90% of its seafood, an audit by the Government Accountability Office found that the FDA inspects less than 2% of its imported seafood. Mislabelled fish can result in inflated prices and health risk to consumers and a general misinformation about the health of fish populations and the ocean. Ask questions– What kind of fish is it? Is it wild or farm raised? Where, when and how was it caught? Check prices– If the price seems too good to be true, it’s likely the species is different than what is on the label. Buy the whole fish– It makes it more difficult to swap species. Buying local and off the docks is a great opportunity to ensure that consumers are truly getting what they pay for. Consumers can ask questions directly to the fisherman who caught the fish, see the whole fish filleted, and leave knowing they got an honest product. This Friday, July 15th will be the first Shop at the Dock event, which I’m really excited for! I was lucky enough to cook lingcod this week, and I have to say, knowing it was fresh and local made it taste all the better. 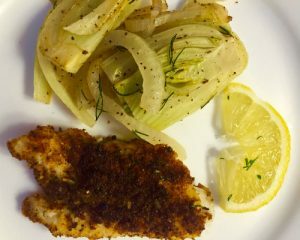 Pan-fried lingcod with herb and parmesan crust and caramelized fennel and onions! I’ll leave you with a nice ocean tune. Thanks as always for reading and I hope you have a fantastic week! This week was one of the most eventful, yet most uneventful weeks of my summer so far. Last Monday, I got into a bit of a bike accident that ended in a trip to the emergency room. With a sprained ankle and stitches, I spent a majority of the week confined to the couch. I am endlessly grateful to be hobbling around at this point and am hoping to make a speedy recovery so I’ll still have time to enjoy the rest of Oregon. Huge shout out to my roommates and fellow Summer Scholars, my mentors, Kaety and Kelsey, and the random strangers who have been SO helpful and understanding. Seafood can be a tricky thing to deal with. Once you’ve got it, what do you do with it? We’re trying to fix this with an eating guide for Shop at the Dock participants. It will list common species to buy off the dock, its favor/texture, how sustainable it is, and a common and delicious way to cook it. This week, I also came across a poignant article about how the commercial fishing industry is declining due to warming waters. “The cod isn’t just a fish to David Goethel. It’s his identity, his ticket to middle-class life, his link to a historic industry. Even having studied it, climate change is definitely one of the more intangible, abstract topics for me. And while the science is crucial, hearing the more humanistic side of climate change really brings the issue home. The article is set on the East Coast, but presents some staggering statistics about declines in catches and also really interesting opinions from fishermen about climate change. I’m determined to get back on my bike by the end of the summer, so I’ll finish this post with a little motivational tune. Thanks for reading and have a wonderful week! Last summer, I got eaten alive by mosquitoes while doing fieldwork. In all his optimism, my professor told me that I should consider myself a grandparent to mosquitoes because my blood helped create their eggs. (Fun fact: Only female mosquitoes take your blood because they use the protein and iron in it to develop their eggs.) While I won’t be baking cookies for my mosquito grandchildren anytime soon, I try and take comfort in helping to create life, as I uncontrollably scratch at my five mosquito bites. Things are moving along with Shop at the Dock! 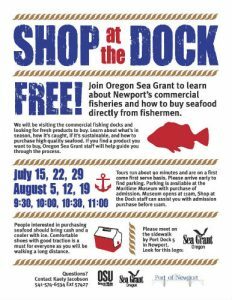 For those of you who didn’t read my last post, Shop at the Dock is an event where OSU staff teach people about Newport’s commercial fisheries and how to buy seafood directly from fishermen. This is fantastic for so many reason- it supports local businesses, promotes understanding of local fisheries, and encourages a sense of responsibility in consumers. Flyers for the event are done and the dates are set for every Friday, beginning July 15th. This week, I began developing a survey to assess the economic impacts of Shop at the Dock. 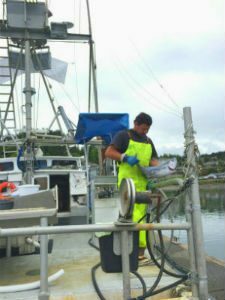 It will be administered to both fishermen and participants at the event to gauge the economic impacts of the program and to understand ways in which the event can be improved, week to week. Still adjusting, but should be done soon! 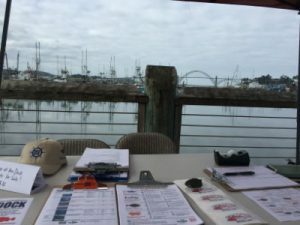 In keeping with the theme of promoting understanding and stewardship of the ocean, Oregon Coast Aquarium celebrated World Oceans Day this past Saturday. The theme was “Healthy Oceans, Healthy Planet” and the goal was to bring attention to the important role the ocean’s health plays in the well-being of the planet and how stopping plastic pollution can benefit the ecosystem. My fellow Summer Scholars and I took the Better Bag Challenge and pledged to avoid disposable bags for at least a year. Such an easy way to make a difference! Thanks for reading! I’ll leave you with a great song by a great band, the Yeah Yeah Yeahs. Lead singer Karen O once said “mosquitoes are one of my least favorite things”, and I really couldn’t agree more. The last couple of months have brought a lot of change. From applying to jobs and internships, to graduating, to moving out of my minuscule apartment in LA, to moving here- it’s been quite the adventure. Welcome or unwelcome, these events have all pushed me closer and closer to the real adult world. As young and carefree (or perhaps naive) as I’d like to be, there’s nothing more sobering than the prospects of figuring out my future and the reality that money can determine what happens in my future. And while I don’t want it to be the most important thing, I do recognize the value in understanding the role money has in the world. 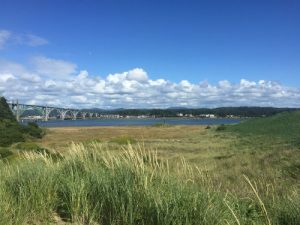 Albeit, economics is not a field I’m very familiar with, I’m extremely excited to be working with the OSU Lincoln County Extension Office on a project to assess the economic and business impacts of direct marketing programs that help marine businesses of Yaquina Bay. 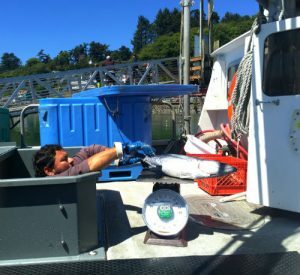 An astounding amount of seafood caught off the Oregon Coast is shipped elsewhere; hence, research was done on the impacts of direct marketing (also known as community-supported fisheries) in the hopes of understanding which fishermen can benefit from these programs. It found that many consumers felt intimidated or unfamiliar buying off the docks. And so began Shop at the Dock (now going into its third summer! 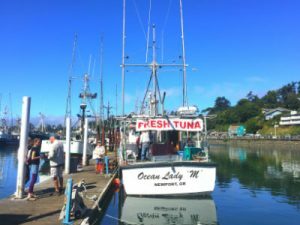 ), which is an event that provides free, guided educational tours of commercial fishing docks in Newport, allowing customers to learn about fisheries, meet local fisherman, and buy fresh, locally caught fish. This project combines all of my interests- education, community building and outreach, and the environment- so I’m really grateful and excited to get started. During my first week, I spent time getting acquainted with the Extension Office. I was amazed to hear about all the work they do, including running the 4-H Youth Program to Family and Community Health Programs. I have my very own (and first!) office with a fantastically distracting view of Yaquina Bay. I also began preparation for Shop at the Dock. 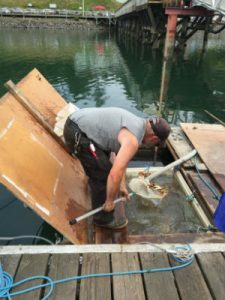 One of the highlights of the week was going on a Dock Walk led by my mentor, Kaety Jacobson, and seeing a boat that was rigged to catch hagfish (mmm…dried slime). I am endlessly in awe of Newport. The weather gets a little gloomy for this California soul, but I love the billowing clouds, the random rain, and the cotton candy sunsets. So far, I’ve had a fantastic time exploring the Newport Farmer’s Market (I ate the pint of blueberries I bought in a day), hiking around Yaquina Head Lighthouse, and laying out on the beach on an exceptionally windy day (my ears are still filled with sand). Newport’s definitely inspired a new playlist this summer, so feel free to listen along. Thanks for reading and stay tuned for more on my research and Newport adventures! !